When people talk about the gene-editing tool CRISPR, they usually mean CRISPR-Cas9. But Cas9 is just one of several CRISPR-associated proteins. A few others are Cas12a, CasY, and CasX. 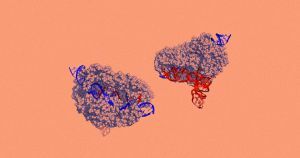 These proteins act as the “scissors” in the CRISPR system, which acts as a natural defense against viruses for some bacteria, similarly to the immune system in humans. The proteins cut DNA at just the right place, and each one has advantages and disadvantages in the nascent field of gene-hacking. Now, researchers from UC Berkeley have discovered that CasX is capable of editing human cells, and it doesn’t carry with it some of the issues involved in Cas9 editing — potentially putting us one step closer to safely gene-editing humans. The Berkeley team details its research on CasX in a study published on Tuesday in the journal Nature. They started by used a cryo-electron microscope to take hundreds of thousands of images of CasX while it edited genes. Using those snapshots, they built an atom-by-atom blueprint of the protein. Based on this image, they were able to determine that CasX is roughly 40 percent smaller than Cas9 and evolved independently of the latter protein — CasX and Cas9 don’t share a common ancestor. This research uncovered two reasons CasX could be better for human gene-editing than Cas9. First is the protein’s small size. This is important because scientists often use a virus called AAV to deliver their CRISPR system. This virus can only carry so much, so using a smaller Cas protein will leave more room for the instructions and other microscopic machinery the system needs to successfully edit a genome. Second, researchers discovered CasX in a bacteria not found in the human body. Many Cas9 proteins, on the other hand, come from bacteria that are commonly found in humans. That means a person could have encountered the Cas9 protein at some point in their lives prior to undergoing Cas9 gene-editing — and researchers really have no idea what impact that could have on the process. Because CasX shares no common ancestors with Cas9, researchers don’t have to worry about a person’s immune system remembering the protein — eliminating one possible issue blocking the path to human gene-editing.